The toys in this section are for your larger birds. Many toys are interchangeable between sizes so please read the descriptions carefully as the images are for representation only. Large chunks of chewing wood, cotton supreme preening rope, two inch birdie bites, and loads of plastic chew-up pieces and reuseable beads to rebuild. Huge Birdie Bite with a four inch wiffle ball inside with lots of beads to make noise with, strung on vegetable tanned leather. We have chunky birdie bites and rolled cardboard for more chewing pleasure. 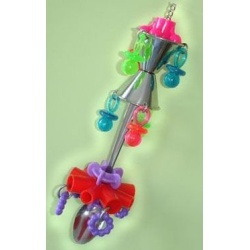 Beak-a-liscious stainless steel and plastic parts combined with a stainless steel spoon, gives the Birdy Bling Bling a total 360 degree action motion. It will turn your cage into the most happenin' birdy party on the block. For medium to large birdies. Oodles of seagrass, rawhide, colorful beads and pine woodpins combine to provide an enticing assortment of textures for curious beaks. Plastic clowns and beads under the seagrass canopy in a three ring circus of fun. 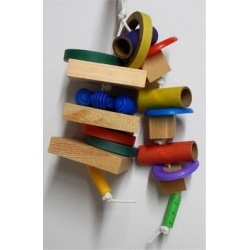 Large sisal rope toy with plastic flower spinner top, heavy duty beads, birdie bite tubes, wood shapes and other heavy plastic shapes for chewing fun. 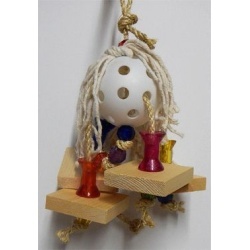 Large hard and soft hunks of wood, plastic star, bagel tubes, 2 inch birdie bites, and plastic chewing pieces strung on pauly rope. Lots to chew on this toy. A larger megafone for our larger feathered friends that will last forever. They will enjoy talking into it as well as playing with the washers and chain. All stainless steel and dishwasher safe. Large wiffle ball with fancy beads and large acrylic spools, cotton supreme for preening, large wood for chewing, all hung on sisal rope. 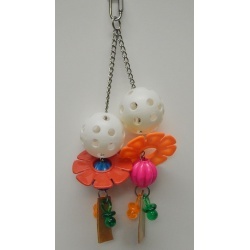 Fancy beads and large plastic ring, vegetable tanned leather rectangles, birdie bites and tubes, squishie porcupine balls with a huge bell, all hung on vegetable tanned leather. Large wiffle ball with heavy duty beads cupped in vegetable tanned leather pieces and large acrylic blocks, strung on vegetable tanned leather with a preening porcupine top. 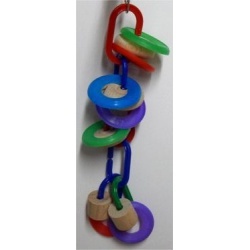 Colorful Plastic links with lots of hard wood chewing pieces and plastic colorful rings. Just clip on the cage and watch the chewing begin! Huge Mammoth birdie bites with birdie bite tubes and rings inside. Fancy beads and cotton supreme rope for preening, all hung on sisal rope. A bird chewers dream project! 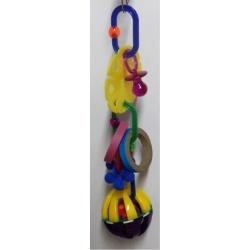 Large plastic links, 2 inch birdie bites, plastic star, medium pacifier and a heavy duty chime ball for extra fun. 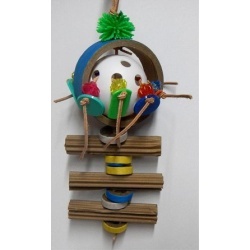 Your birdie will love hearing the chime ball swinging around. Cotton supreme rope, heavy duty beads, pacifiers, stars, C-links, spinners, colored wiffle balls, marbella rings and large wooden chunks. Lots of reusable parts on a stainless steel link. Sisal ropes and supreme cotton for preening pleasures. 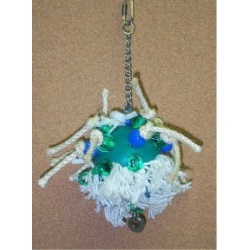 Bright, colorful beads, stainless steel washers, chain and link on an oversized colored whiffle ball. Assorted colors, all beautiful!! An all hardwood chewing toy. Thick wooden tire wheels and the center pieces have large piece of wood and rings that move up and down on 1/4 inch leather strip. Cotton Supreme ropes for preening and a large clanging bell for noise. Great chewing and preening toy!! Well over a pound of wood. 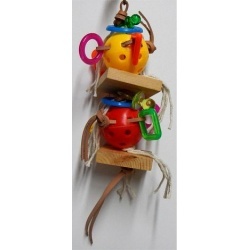 Large chunks of chewing wood, cotton supreme preening rope, vegetable tanned leather strips interwoven with marbella shapes through colored wiffle balls and topped with a pacifier on a stainless steel link.